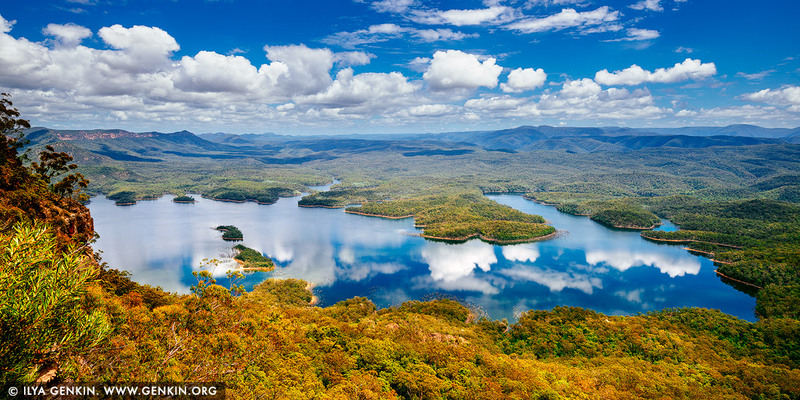 Panoramic view over Lake Burragorang in the lower Blue Mountains of New South Wales, Australia. McMahons Lookout offers splendid, unspoilt views across the backwaters Lake Burragorang, Sydney's man-made water supply dammed reservoir which supplies 80% of Sydney's precious water supply. This is a rare look at a different side of the Blue Mountains. Far to the south are the region's sandstone cliffs but in the foreground, smudged with the distinctive blueness of the mountains, are low-lying, rolling hills covered with eucalypts. And below is the drowned river valley with the occasional hilltop, still covered with trees, rising from the waters. This image belongs to the travel and nature stock photo library. This stock photo of Lake Burragorang is available for licensing for commercial and editorial uses including websites, blogs, books, magazines, brochures and advertising. Restrictions may apply for images which contain third party copyrighted material or sensitive subjects. Photos of artwork are for editorial use only. This image id AU-LAKE-BURRAGORANG-0001 of Lake Burragorang, is copyrighted © by Ilya Genkin. This is not a public domain image.